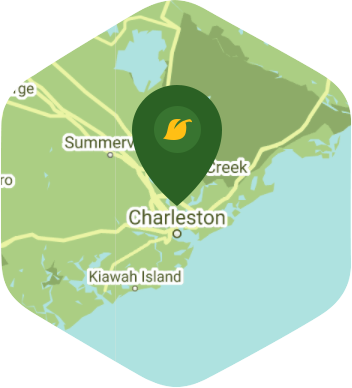 Book a skilled lawn pro in Charleston. Backed by a total satisfaction guarantee and amazing customer support. Cobblestone streets, horse drawn carriages, and pastel antebellum architecture are the three things that most people associate with the city of Charleston, SC. However, there is more to this city and they are all worth visiting whenever you get some free time on your hands. Riley Waterfront Park, Middleton Place, and the Downtown area are all great places to hangout in whenever you're free from work. However, you might not be able to enjoy any of these attractions if you're needed at home to care for your yard. Well if you want reliable yard care, then call Lawn Love because we are pros when it comes to taking care of yards. Just leave the hard work to our team of independent lawn pros because they can do it all. Whether it's standard lawn mowing, leaf removal, or gutter cleaning, you can count on us to do it right. We are combining customer service with a super easy and convenient online booking system because we want to take this industry to another level. As long as you have an internet connection and a smartphone or computer, you can book your yard care service in only a few minutes. If you want the best yard care service in Charleston, then give us a ring at 843-806-0844. You can also try our free online quote with no commitments. Great work in the yard and good with contacting me about the visit. First time using this service and it was the best service this property had seen in a long time. Will use again and recommend. And thank you! Thank you for getting all the leaves out of the yard! My yard looks fantastic! They did a great job trimming back the bushes and cleaning up the yard! Thank you so very much! Taylor did an incredible job! He always told me when he was going to be there and he left the lawn looking way better than I ever was able to do on my own. Did a great job clearing out the weeds. Rated 4.8 / 5 stars in 162 Charleston customer reviews. It looks like the expected precipitation in Charleston is 1.15 inches, which means your lawn got a nice soaking—leave those sprinklers off today. Dusk and dawn are the best times to water your lawn (the sun will rise at 6:47 AM and set at 7:52 PM today in Charleston). Here are some average lawn care prices for homes in Charleston. Average lawn size 6,634 sq. ft.